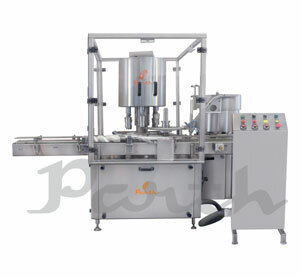 The Automatic Screw Cap Sealing Machine is precision built on sturdy welded MS frame completely enclosed in stainless steel sheet and doors are providing to facilitate the servicing of machine. The feed container moving on conveyor belt are fed into star wheel, bringing the container below the sealing head in the subsequent indexing part, mean while the bottle pickup a cap from the delivery chute of cap feeding bowl, where the body and the neck of the container are positioned below the rotating head, where the sealing head is performing perfect operation of threading & sealing. Output/Hour* 9000 to 12000 bottles. No. of Sealing Head 12 Nos. Electrical Specification** Main Machine 1.5 HP / 415 Volts / 50 Hz. Cap Orientation 0.25 HP/ 415 Volts/ 50 Hz. Machine Dimensions** 2000 mm (L) x 1000 mm (W) x 2150 (H) Approx. Case Dimensions 2200 mm (L) x 1200 mm (W) x 2350 (H) Approx. Net Weight 550 Kgs. Approx. Gross Weight 850 Kgs. Approx.